The two wolf types found in India are represented by two isolated populations and believed to be two sub-species of Canis lupus. One of these wolf, locally called Himalayan wolf (HW) or Tibetan wolf, is found only in the upper Trans-Himalayan region from Himachal Pradesh to Leh in Kasmir and is considered to be C. lupus chanco. The other relatively larger population is of Indian Gray wolf (GW) that is found in the peninsular India and considered to be C. lupus pallipes. Both these wolves are accorded endangered species status under the Indian Wildlife Protection Act. In 1998 for the first time in India, we initiated molecular characterization studies to understand their genetic structure and taxonomic status. Since then, we have analyzed the genetic variability in 18 of the total of 21 HW samples available in Zoological parks along with representative samples of GW, wild dogs and jackals. Our study of mitochondrial DNA diversity across three different taxonomically informative domains i.e., cytochrome-B gene, 16S rDNA and hypervariable d-loop control region revealed HW to be genetically distinct from the GW as well as from all other wolves of the world, including C. lupus chanco from China. Most importantly, d-loop haplotypic diversity revealed both HW and GW from India to be significantly diverse from other wolf populations globally and showed that these represent the most ancient lineages among them. Phylogenetic analysis revealed the Indian wolves as two independent lineages in a clade distinct and basal to the clade of all wolves from outside of India. Conservative estimate of evolutionary time-span suggests more than one million years of separation and independent evolution of HW and GW. We hypothesize that Indian wolves represent a post-jackal pre-wolf ancestral radiation that migrated to India about 1-2 mya and underwent independent evolution without contamination from other wolf like canids. The study thus, suggests that Indian subcontinent had been one major center of origin and diversification of the wolf and related canids. Further, the significant degree of genetic differentiation of HW from GW and of these two from other wolves, suggest the interesting possibility of them to be new wolf species/subspecies in evolution that may need to be described possibly as C. himalayaensis and C. indica (or as C. lupus himalyaensis and C. lupus indica), respectively. Thus for the first time, the study reveals new ancient wolf lineages in India and also highlights the need to revisit the origin, evolution and dispersion of wolf populations in Asia and elsewhere. Simultaneously, it increases the conservation importance of Indian wolves warranting urgent measures for their effective protection and management, especially of the small HW population that at present is not even recognized in the canid Red List. The gray wolf, Canis lupus, is believed to be the most widely distributed terrestrial mammal that ever lived on earth at one time point , originally inhabiting major parts of the Northern hemisphere. From being omnipresent and abundant, it has assumed endangered species status in many countries. In most parts of Southern, Western and Northern Europe and Americas, major gray wolf populations are lost and their present distribution is highly fragmented . In England and Japan, it has already become extinct while in many other parts it is on the verge of extinction . The wolves are now restricted to few large forested areas in Eastern Europe, a few isolated mountain ranges in the Mediterranean, mountains and semi-desert areas of middle-East and the wilderness areas of North America, Russia and China, with largest concentrations in Russia followed by Canada and Alaska [cf. ]. Therefore, serious efforts have been initiated in Europe and America for protection and conservation of the existing wolf populations in recent years. In the last century, up to 32 sub-species of gray wolf have been described by wolf taxonomists, based on the variations in physical features, behavioral aspects and geographical distribution, many of which are now believed to be extinct [4, 5]. Status of many of these subspecies is contested eg., subspecies campestris, chanco and desertorum are suggested to be synonymous of subspecies lupus , making the gray wolf taxonomy highly debatable pending validation and revision. Presently, only six subspecies viz., lupus, campestris, albus, tundaram, lycaon and nubilus, are believed to be surviving globally, and only the first two being in Asia . In recent years, though many molecular-genetic studies were carried out to understand the origin and evolution of canidae family [[7, 8] and cf. therein; ) and also on the population dynamics of isolated, specific gray wolf populations [3, 10–12], similar studies to resolve the largely debatable gray wolf taxonomy at the subspecies level are generally lacking. The two detailed studies on the latter aspect based on mitochondrial genome variations (mtDNA d-loop haplotyping) show little genetic partitioning on the continental or regional scales [13, 14]. In Indian subcontinent, wolf is known to exist for a longtime but not much is known about its origin and evolutionary history. Generally, as per the conventional taxonomy, it is believed that the small numbers of wolves found in today's India, are two different sub-species of Canis lupus which are represented by geographically isolated broadly non-overlapping (allopatric) populations. One of these wolf populations is found only in the upper Trans-Himalayan region of India across the two Northernmost states of Himachal Pradesh and Jammu and Kasmir, which as per the available census numbers ~350 individuals . This Himalayan wolf (HW) population, adapted to the cold environment, is considered to be representing the extant population (direct relatives) of the relatively better known Tibetan wolf, Canis lupus chanco, which is found throughout central Asia with its range extending into Tibet, China, Manchuria and Magnolia . On the other hand, the second wolf population estimated to be less then 1500 http://www.wolf.org/wolves/learn/basic/populations/fall99insert.asp, is found throughout the arid /semi-arid plains of pennisular India. These wolves, commonly called Indian gray wolf (GW), are believed to represent the second sub-species in India, i.e., C. lupus pallipes that is also found in the middle-Eastern countries like Iran and Israel . The wolf in India are accorded schedule '1' endangered species status under the Indian Wildlife Protection Act of 1972 and of CITES, and in last few decades federal efforts were initiated for wolf protection and conservation by setting up wildlife preserves in the country and captive breeding programs in few National Zoological Parks. Since early 1970s, to help the conservation efforts few studies were also initiated to understand the ecology and population biology of wolves, but all of these were on GW of peninsular India (Wildlife Institute of India website). The only detailed account on HW population is by Fox and Chundawat  and its earlier references in the wildlife surveys of snow leopard . There is essentially no study attempted to understand the genetics of Indian wolves and their relationship with wolves from other parts of the world. Perusal of the published literature on molecular-genetic analysis of wolf and other canids, reveals only six analyzed samples referred as Indian wolf, five of which originated from Afghanistan  and the source of the only one sample used in studies by Wayne group [14, 18] is indicated to be from India. Under this dismal scenario and ever increasing threat to the remaining small wolf populations in India, it becomes imperative to understand their genetic make-up and exact taxonomic status between themselves and with other world-wide wolf populations to have a long-term and effective plan in place for their continual survival and conservation. Many features of mtDNA viz., high mutation rate than nuclear genome; uniparental (maternal) inheritance, high copy number and lack of recombination, makes it the biological material of choice for mirroring the evolutionary past of a species. Moreover, the mtDNA diversity can be efficiently used to infer both, relatively recent as well as ancient evolutionary events by selectively analyzing selection-pressure independent (d-loop control region) or dependent (essential functional genes like cytochrome-B) domains. These attributes made mtDNA analysis a powerful tool in the molecular systematics pursuits, which in recent years has extensively and successfully been utilized to understand the population history, phylogeography and taxonomic relationships of a large number of animal species. Our present day understanding of origin, evolution and taxonomy of wolf and related canid species is largely based on mtDNA polymorphism analysis [8, 9, 14, 18]. It is in this background; in 1998 we initiated molecular characterization studies on the highly endangered HW to understand their genetic structure and taxonomic status relative to the GW and other wolf-like canids from Pennisular India and wolf populations from rest of the world. Our detailed mitochondrial DNA polymorphism studies on a large number of HW and representative samples of GW, jackal and wild dog of India followed by comparative genomics with information available for world-wide wolf populations have led to some novel and startling findings about the origin and evolution of wolves of India. Significantly, our studies suggest that: a) both the Indian wolf populations are genetically unique within themselves and both of them from all other wolf populations recorded world-wide; b) HW is distinct from the purported similar wolf from China, C. lupus chanco, and represent the most ancient wolf lineage ever recorded and analyzed using molecular means; c) similarly, GW is distinct from the purported similar wolves from South-East Asia, C. lupus pallipes, and probably also represent the other ancient wolf lineage from India; d) each of the two wolf populations from India thus represents a case of new wolf species in evolution waiting to be re-christened; e) Indian subcontinent as one ancient center of wolf origin and diversification, wherein the two wolf populations represent wolf/canid lineages derived from an ancestral wolf radiation that underwent evolution independent from other world wolf populations for the last 1-2 mya. Thus, our results increase the biological significance of the Indian canid populations and warrants urgent and effective conservation measures for their protection and management. The HW population is estimated to be of ~350 animals in the wild, spread over an area of 70,000 km2 encompassing the Trans-Himalayan region of Jammu and Kashmir and Himachal Pradesh . Apart from these animals in the wild, there are a total of only 21 live animals in four of the Zoological Parks of India . Most of these animals are captive bred from few wild caught animals from the Transhimalayan region. In the present study we analyzed 18 of these animals available in the Padmaja Naidu Himalayan Zoological Park, Darjeeling, West Bengal. In addition to these animals, we analyzed wild caught representative samples of related canids from middle India viz. gray wolf (originally caught from three widely separated geographical regions in middle India), wild dog and Indian jackal, available in the Nehru Zoological Park, Hyderabad, Andhra Pradesh and Sakkarbaug Zoo, Junagarh, Gujarat (Table 1). From each animal, ~10 ml blood was drawn using vaccutainers having EDTA as anti-coagulant and transported from the Zoo to the laboratory at room temperature where the same were stored at 4°C till further use. The total genomic DNA was isolated from each of the samples following the lysis-freeze fracture method  for molecular analysis. To understand the genetic status of HW in relation to other related canids from India and other parts of the world, nucleotide diversity was ascertained for three taxonomically informative domains of the mitochondrial genome. These included, part of cytochrome-B gene, complete cytochrome-B gene for few representative samples, hypervariable d-loop control region and 16S rDNA. In each case, the target mitochondrial sequences were PCR amplified using standard protocols on PE9600 thermocycler. The PCR reactions were set using approximately 50 ng of template genomic DNA in 15-20 μl reaction volume containing: 5 pico-moles of each primer, 150 μM dNTP, 1.5 mM MgCl2, 0.1 M KCl, 20 mM Tris-HCl, and 0.5 to 1.0 U of AmpliTaq Gold polymerase (Perkin Elmer). In general, PCR profile comprised an initial denaturation of 10 min at 95°C, followed by 35 cycles of: 94°C for 1 min., 50-55°C for 1 min., 72°C for 2 min. ; and 72°C for 5 min. The PCR products were treated with exonucleaseI and shrimp alkaline phosphatase at 37°C and 80°C, 15 min each to remove the remaining primers and free nucleotides. Subsequently, the purified PCR products (~100 ng) were sequenced for both strands using the Big dye terminator ready reaction kit (Perkin Elmer). Further, to confirm sequence data, many of the samples were sequenced more than once. Sequencing PCR cycle condition were: 30 cycles of 96°C for 10 sec., 50°C for 5 sec. and 60°C for 4 min. Extended products were purified by alcohol precipitation followed by washing with 70% ethanol. The processed samples were then dissolved in loading dye and sequenced using automated DNA sequencer ABI Prism377 or ABI Prism3700. Sequences were edited using auto-assembler software package for further analysis. Cytochrome-B gene: A ~332 bp conserved region of mitrochondrial cytochrome-B gene towards the amino-terminus of the protein was amplified and directly sequenced using primers L14841 [5'-AAAAAGCTTCCATCCAACATCTCAGCATGATGAAA-3'] and H15149 [5'-AAACTGCAGCCCCTCAGAATGATATTTGTCCTCA-3'] described by Kocher et al , for all the samples. In some cases, the PCR amplified product was gel purified using gene clean kit (BIO 101), and cloned in pMOS T vector (Amersham Pharmacia Biotech) following manufacturers details. In each case about 10 recombinant clones were randomly chosen and sequenced as above using M13 universal sequencing primers. In addition, complete cytochrome-B gene sequence was determined for one sample each of HW, GW and Indian jackal. For the purpose, the target gene was amplified and sequenced using the conserved flanking primers L-14724 [5'-CGAAGCTTGATATGAAAAACCATCGTTG-3'], H-15915 [5'-AACTGCAGTCATCTCCGGTTTACAAGAC-3'] and internal primers L-15162 [5'-GCAAGCTTCTACCATGAGGACAAATATC-3'], L-15513 [5'-CTAGGAGACCCTGACAACTA-3'] and H-15149 [see above] . 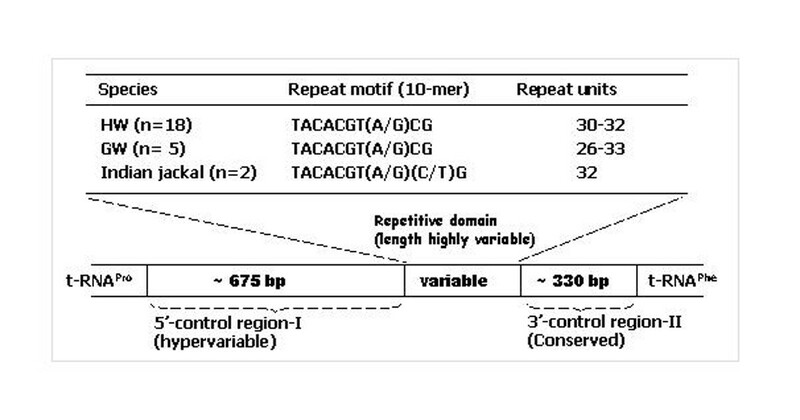 D-loop control region: For each of the sample, the complete d-loop region (Figure 1), encompassing 5' hypervariable control region-1 (CR-I), repetitive region and 3' relatively conserved control region-II (CR-II) was amplified and sequenced using the primers described by Tsuda et al . Initially the region was amplified using primers DL-14 [5'-TGTAAAACGACGGCCAGTGCTCTTGCTCCACCATCA-3'] and DH-7 [5'-CAGGAAACAGCTATGGCCCGTGCGACTCATCTTGGC-3'], which amplified a product of ~1300 bp. To sequence the amplified products, two more internal primers were used along with the above two. The two internal primers were DH-6 [5'-CAGGAAACAGCTATGGCCCCCCTTGATTTTTATGCG-3'] and DH-10 [5'-TGTAAAACGACGGCCAGTATCACTCATCTACGACCG-3']. Mitochondrial d-loop control region organization. Upper panel shows the sequence polymorphism seen in the repetitive domain of d-loop in canids from India (present study). Partial d-loop sequences were also amplified and sequenced using the primers DLH-16340 [5'-CCTGAAGTAGGAACCAGATG-3'] and Thr-L15926 [5'-CAATTCCCCGGTCTTGTGAACC-3'] , which essentially gives ~ first 250 bases that are obtained using the primer DL-14 (that span the t-RNAPro gene, see above) in addition to about 70 additional bases corresponding to phenylalanine t-RNAPhe that is present on the left of t-RNAPro. 16S rDNA: Part of 16 sRDNA was amplified and sequenced using the primers 16Sar-L [5'-CGCCTGTTTATCAAAAACAT-3'] and 16Sbr-H [5'-CCGGTCTGAACTCAGATCACGT-3']  for all the 27 samples analyzed in the study. The Genbank database (National Center for Biotechnology Information, USA: NCBI Home page http://www.ncbi.nlm.nih.gov) was searched for similar sequences using BLAST search. Based on the search, large number of reference mitochondrial DNA sequences described for wolf and other related canid species were retrieved from the database, for each of the analyzed domain for phylogenetic comparisons. The details of the reference sequences viz., EMBL accession number, source species, sequence length and location, and their original contributors are given in Tables 2 and 3. The 90 d-loop reference sequences retrieved for comparative analysis represented the wolf samples from all over the globe across all the continents. In comparison, there were only few wolf reference sequences specific to cyto-B gene and none for 16S ribosomal DNA. Accordingly, for these two mitochondrial domains reference sequences were from related canid genera/species. The sequences obtained in the study were aligned with corresponding reference sequences from the EMBL database using the CLUSTAL program  to identify variable nucleotides. The sequences were further edited using GENEDOC program . Diversity statistics of the compared sequences were obtained using Dna-SP ver. 3.51 [; http://www.bio.ub.es/~julio/DnaSP.html]. The nucleotide diversity was used to derive genetic distance estimates and phylogenetic relationships using various analytical routines available in the software package PHYLIP 3.6 [; http://evolution.genetics.washington.edu/phylip.html] and Phylo_Win . The aligned sequences, manually checked for gaps and edited at the ends to avoid missing information in some of the compared taxa/entries were used to calculate genetic distance coefficients corrected for multiple hits by the Kimura two parameter , TN  and HKY model  which take into account unequal nucleotide frequencies in present day sequences and also unequal transitions/transversion rates. The distance estimates were used to construct phylogenetic trees using neighbor joining (NJ) and UPGMA methods [32–34]. The phylogenetic analysis of the character-state matrices (aligned sequence data) was also carried out using the maximum-parsimony and maximum-likelihood approaches and Kimura 2-parameter with gamma correction. Support for nodes found on the shortest tree was assessed by bootstrap analysis . The phylogenetic trees based on mtDNA d-loop polymorphisms, were rooted using Indian jackal, which represent one of the nearest outgroup species of gray wolf in the Canis genus . Initially, raccoon dog and fox, the two distant canid relatives of wolf (Table 2) were also used for comparison, but were not used in final analysis. Similarly, for 16S rDNA based analysis also Indian jackal was used as an outgroup taxa, as the corresponding data was not available for any other canid in the EMBL database. In comparison, no particular outgroup was defined in the cytochrome-b gene based analysis, as the genetic status of wolf is well defined in relation to the other canids and the purpose of the study was only to define the place of Indian wolves relative to the wolf from elsewhere. The corrected Kimura distance estimate observed for HW-GW pair wise comparisons of cytochrome-B sequence data were used to derive the estimate of evolutionary time separating the two, using the conservative estimates of sequence divergence rates reported for canid mtDNA divergence . Molecular genetic assessments have become necessary and important guides for description of biotic diversity and its management. This is so because the conventional taxonomy might fail to recognize phylogenetically distinct forms, misdirecting the conservation efforts for endangered species for protecting biological diversity . In India there are two small populations of wolves (HW and GW) believed to be two different subspecies of C. lupus that are found in many other parts of the Middle-East/Central Asia. One of these populations of HW which numbers only ~350 in the wild  and is highly endangered, is not even recognized in SSC/IUCN list on wolves of the world probably, among other reasons, because of its purported status of a subspecies chanco that is know from many other countries. The present study, first on molecular genetic analysis of HW and other canid samples from India, involving DNA typing of haplotypic diversity across cytochrome-B gene, 16S rDNA and D-loop control region of mtDNA, reveals many novel insights into the evolutionary past and taxonomic relationships of the present day extant populations of wolves of India. Most importantly, the data reveal HW and also the GW from India to be the most ancient wolf lineages genetically unique from all those found world-wide suggesting a need for revision of the wolf taxonomy and present day understanding of its origin and evolution. The results have highly significant implications in the conservation priorities and efforts on wolf both at the National and International level. We amplified and sequenced 2000-2200 bp of three domains of mtDNA, ~332 bp of protein coding cytochrome-B gene, 544 bp of 16S rRNA gene and 1200-1370 bp spanning the total d-loop control region from 23 wolf samples (18 HW, 5 GW) and 2 samples of Indian jackal. (Table 1). In case of Indian wild dog, only regions of cytochrome-B and 16S rRNA gene could be amplified and sequenced. In addition, the complete cytochrome-B gene was also amplified and sequenced for one sample each of HW, GW and jackal. Using BLASTn search with the respective sequences, most of the related sequences mainly of different wolf populations/sub-species and many of the related canid species were retrieved from the EMBL database for comparison and phylogenetic analysis (Tables 2, 3). The sequence data thus compared and analyzed for DNA polymorphisms are summarized in table 4. The mitochondrial cytochrome-B sequencing analysis of 322 bp region, of the 18 HW and 3 GW samples revealed a total of four transitions (sequence divergence = 1.24%) distinguishing the two types, and two additional transitions defining two haplotypes for each of them. In comparison, HW differed for 8 transitions (3 A>G, 1 G>A, 4 T>C; sequence divergence = 2.48%) and GW for 4 transitions (2 A>G, 2 T>C) from the holarctic wolf. The data thus show the three wolf types to be genetically different from each other with HW wolf to be most divergent. Further, comparisons with the other canid species reveal HW to be most basal among the three types nearest to their immediate outgroup species in the canidae family (Figure 2a). Figure 2a: ML tree based on polymorphism in 322 bp of Cyto-B gene showing relationship of HW with other canids from India and elsewhere; Distance: Gamma corrected K 2-P. Figure 2b: ML tree based on complete Cyto-B gene polymorphism showing relationship of HW with jackal and gray wolf from India and 2 reference canids from elsewhere; Distance: Gamma corrected K 2-P. The rate of mitochondrial DNA sequence divergence within the canids has been estimated to be 1.3-1.7% per million years . Considering a conservative average estimate of approximately 1.5% per MY, the above observed sequence divergence would mean a divergence of ~0.8 MYA between HW and GW and ~1.65 MYA between HW and holarctic wolf. Further, these divergence estimates are much more than what has been reported for intraspecific variation [cf. ], suggesting the three to be more akin to three different species. The complete 1140 bp sequencing of the mitochondrial cytochrome-B gene also revealed similar divergence between HW and GW and HW to be more near to jackal (Figure 2b). Sequencing of ~550 bp of the mitochondrial 16S rDNA revealed relatively low variation among all the 27 samples. Only 32 nucleotides were found to be polymorphic and informative. EMBL database search didn't reveal similar sequences for the reference wolf populations, and thus detailed phylogenetic analysis was not done. Nevertheless, the data were analyzed for the samples sequenced in the study that revealed the broad generic affinities of HW and GW to the jackal /dog clad and these being very divergent from the wild dog Cuon alpines (data not shown). Sequencing of complete D-loop analysis revealed a very large number of substitutions and indels specific to HW and GW compared to all other wolf haplotypes documented world-wide, all across the 5'CR-I, hypervariable repetitive domain as well as relatively conserved 3'-CR-II region. In general, the d-loop CR-I region was found to be most informative in ascertaining the genetic status of the Indian wolf types (HW and GW) because of the availability of the corresponding data for other wolf types from outside India. 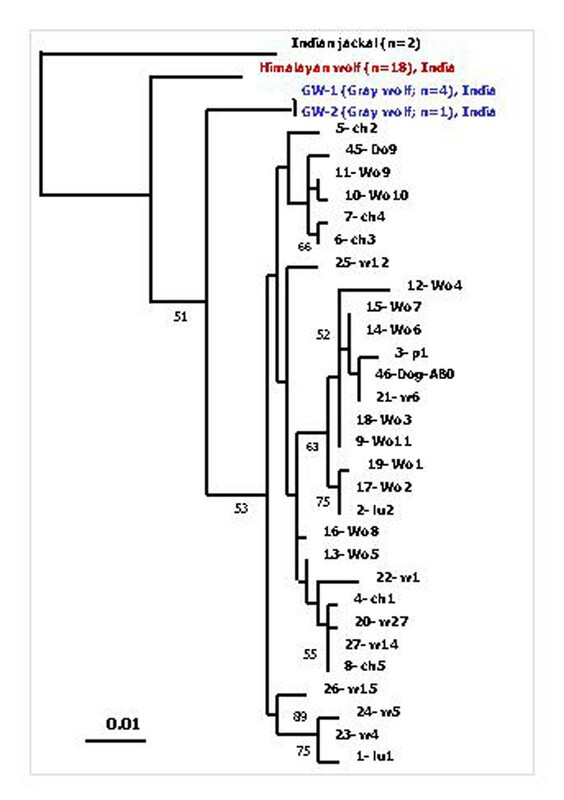 The sequence comparison and phylogenetic analysis of the CR-I polymorphism over its varying lengths established Indian wolves not only to be genetically very distinct from all others wolves but also forming a non-overlapping separate clade basal to the whole phylogenetic tree of world-wide wolves, more closer to the Jackal used as outgroup canid species in the study (Figures 3,4,5,6). This genetic differentiation was overwhelmingly evident in the large number of unique sequence polymorphisms revealed in HW and GW sequences. When compared to all other reported haplotypes over 655 bp of the CR-I region, we found 2 deletions (comprising 6 bp), 1 transition (C>T) and 1 transversion (G/A>T) unique to both HW and GW. In addition, there were 12 transitions (4 G>A, 3 T>C, 5 C>T) and 2 deletions specific to the HW, and 8 transitions (5 C>T, 2 T>C, 1 G>A) specific to GW. All the 18 HW samples were represented by only one haplotype (HW-India) whereas there were two haplotypes seen for GW samples (GW-1, GW-2) differing in only one transition. ML tree based on 233 bp of d-loop region-I polymorphism showing relationship of HW with 75 other wolf populations from India and elsewhere and 2 dog species; Distance: Gamma corrected K 2-P. Reference taxa are as per codes in Table 3. NJ tree based on 545 bp of d-loop control region-I polymorphism showing relationship of HW with 45 other wolf populations from India and elsewhere and 2 dog entries; Indian jackal is used as outgroup; Distance: Corrected K 2-P. Reference taxa are as per codes in Table 3. ML tree based on 651 bp of d-loop control region-I polymorphism showing relationship of HW with 28 other wolf populations from India and elsewhere and 2 dog entries; Indian jackal is used as outgroup; Distance: Gamma corrected K 2-P. Reference taxa are as per codes in Table 3. NJ tree based on 675 bp complete d-loop control region-I polymorphism showing relationship of HW with 20 other wolf populations from India and elsewhere and 1 dog species; Indian jackal is used as outgroup; Distance: corrected K 2-P. Reference taxa are as per codes in Table 3. The repetitive domain of the d-loop control region was found to be highly variable for all the samples of HW, GW and Indian jackal sequenced in the study. The variation was seen both in the number of repeats as well as due to extensive intra-individual heteroplasmy for specific nucleotides of the repeat motifs (Figure 1). The 10-mer repeat motif of HW and GW was similar to what had been reported earlier by Tsuda et al (1997) for dogs and wolf, but unlike their results, varied in number of tandem units (30-32 for HW and 26-33 for GW). In comparison to HW and GW, the repeat motif for Indian jackal though of same length and sequence, but had two variable nucleotides in its motif. The data could not be compared, as no corresponding data are available for other wolf populations. Similar to CR-1 region, many variations in the 300 bp CR-II region were found unique for HW and GW when compared to the few corresponding haplotypes reported earlier studies. There was only one haplotype for all the samples of HW and similarly one in case of GW. There were three transitions (1 C>T, 1 A>G, 1 G>A) and one transversion (A>C) unique to HW haplotype and one 4-bp indel (TATA) and one transition (T>C) unique to the GW haplotype when compared to the eight other haplotypes documented in earlier studies. 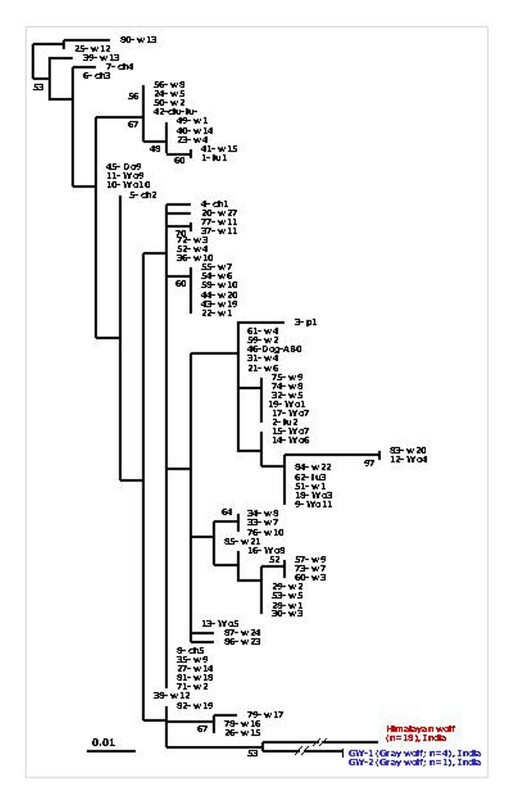 Phylogenetic analysis done using different character state (ML, MP) and distance (NJ) approaches for all the three types of mitochondrial DNA sequences analyzed in the study revealed almost identical tree topologies with little variation, if any, in branch lengths and/or finer arrangements in a given cluster. Significantly, in all the analyses, the two Indian wolf types (HW and GW) turned out to be genetically unique and most ancient from all other worldwide wolf-populations, but essentially belonging to same clade of the gray wolf in the context of canidae family with jackal as the closest ancient relative (Figures 2,3,4,5,6). The taxonomic potential of the three different domains analyzed in the present study is in complete agreement with what has been widely demonstrated and recently outlined by Tautz et al . While the quickly evolving mitochondrial control d-loop region was found to be most informative to understand the taxonomic affiliations of Indian wolves to other related wolf populations, the relatively conserved mitochondrial cytochrome-B gene and 16S rDNA were useful in resolving their higher level phylogenetic status in the canidae family. DNA polymorphism of the partial cytochrome-B gene has been used to reconstruct the canidae systematics , confirms the two Indian wolf types to be members of the jackal-cyote-wolf clade, more similar but distinctly basal to the holoarctic gray wolf and dog lineage (Figure 2a). Similarly, comparison of the complete cytochrome-B gene for which only two reference sequences belonging to canidae could be found in the public domain , also reveal HW and GW to be descendant of the jackal lineage but basal to the dog supported with high bootstrap values (Figure 2b). Between HW and GW, the former was conspicuously more basal in the lineage. The taxonomic status of HW and GW from India to the Jackal-Wolf-Dog clade was equally evident in 16S rDNA based phylogram (not shown). In comparison, the d-loop polymorphism for which the corresponding data are available for most of the world-wide wolf populations, was found to be most informative to ascertain the genetic status of HW and GW vis-à-vis all the previously analyzed wolf populations from outside of India. Our extensive comparative analysis involved almost all the wolf haplotypes described in the literature to date, covering different lengths of the d-loop CR-1 region [viz., 233 bp (76 sequences, 32 haplotypes), 545 bp (46 sequences= 35 haplotypes), 651 bp (29 sequences, 24 haplotypes)]. 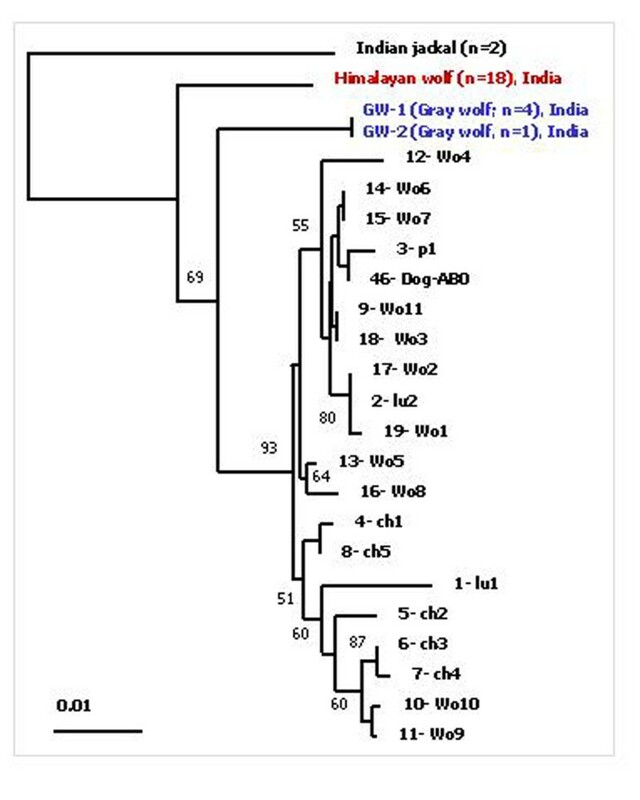 The analysis conclusively revealed both Indian wolf types (HW and GW) to be genetically most divergent and forming a completely separate clade without even a single overlap with any of the haplotypes seen in the other wolves of the world. Moreover, the HW and GW clade was found to be closest to the jackal, one of the nearest ancestral canid species and basal to the other major clade comprising all other wolf haplotypes, clearly indicating these to be the derivatives of an more ancient independent wolf radiation. Significantly, both HW and GW were found to carry significant d-loop polymorphism that was not seen in both of their corresponding purported sub-species of C. lupus i.e., chanco and pallipes, respectively. Indian HW analysed in the study, which has been referred in published literature as Tibetan/Chinese wolf C. lupus chanco, differs from the later for 24 nucleotides over 655 bp of CR-I region and does not carry any of the latter's diagnostic polymorphism. These data conclusively show that HW found in India is genetically very different from the more abundant and widely distributed Tibetan wolf chanco. 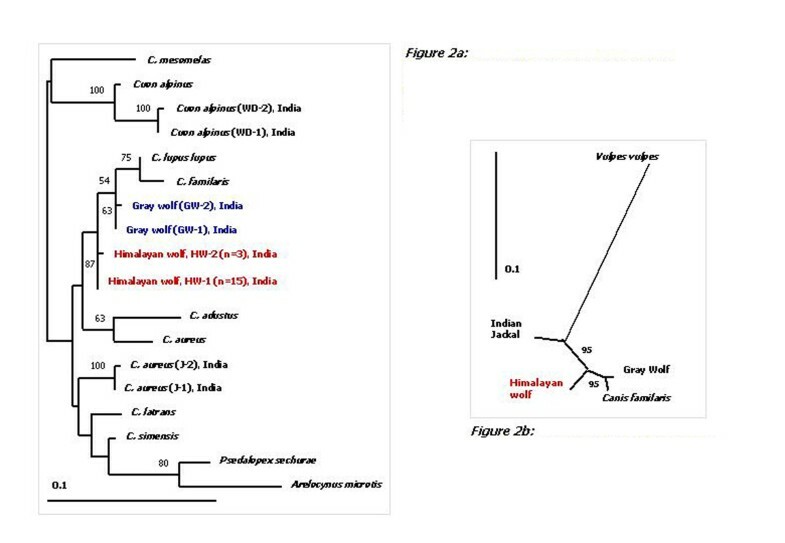 Similarly, the GW samples analyzed in the study, neither have the diagnostic nucleotide polymorphism (A>G) observed by Tsuda et al  in pallipes samples originated from Afghanistan, nor show any similarity with the wolf haplotype 'w12' reported for the only other C. lupus pallipes sample that also originated from India [14, 18]. Moreover, a large number of diagnostic polymorphisms (see above) were seen in the GW samples in the present study that were not present in any of the above few samples of C. lupus pallipes reported earlier [9, 14, 18]. The findings thus suggest that the GW from India is not the pallipes found in Middle East and Central Asia. The apparent discrepancy with respect to the only sample from India analyzed by Vila et al  having a very different haplotype (w12) can be explained by the possibility of an wolf-female dog hybridization, a phenomenon that has been observed and reported earlier. Incidentally, in the analysis carried out by Vila et al , 'w12' haplotype of the Indian wolf was also one of the closest wolf haplotypes to those of the dog haplotypes. Simultaneously, it is significant to mention here that the GW samples in the present study, though few in numbers (n = 5) were wild animals, caught from geographically different parts of the peninsular India giving strength and credence to the results of the study. All the three types of data strongly suggest HW to represent one of the oldest wolf lineage that was followed by the one that gave rise GW. These two lineages were revealed to be distinct from the third seemingly more recent lineage leading to a broad loosely structured clade comprising all other global wolf populations. It was noteworthy that in all the phylogenetic reconstructions tested in the study, both the lineages specific to Indian wolves appear together in a genetically distinct completely separate monophyletic clade with no overlap with any of the haplotypes of the above referred other broader clade for wolves from rest of the world. These results suggest that Indian wolves represent a relic ancestral lineage of wolf that evolved in isolation for a very long time from the evolutionary lineage that is represented by all other wolves from outside India. The estimates of evolutionary time based on rate of sequence divergence suggest ~1.5 mya of age for the lineage that resulted in the HW and GW clade. 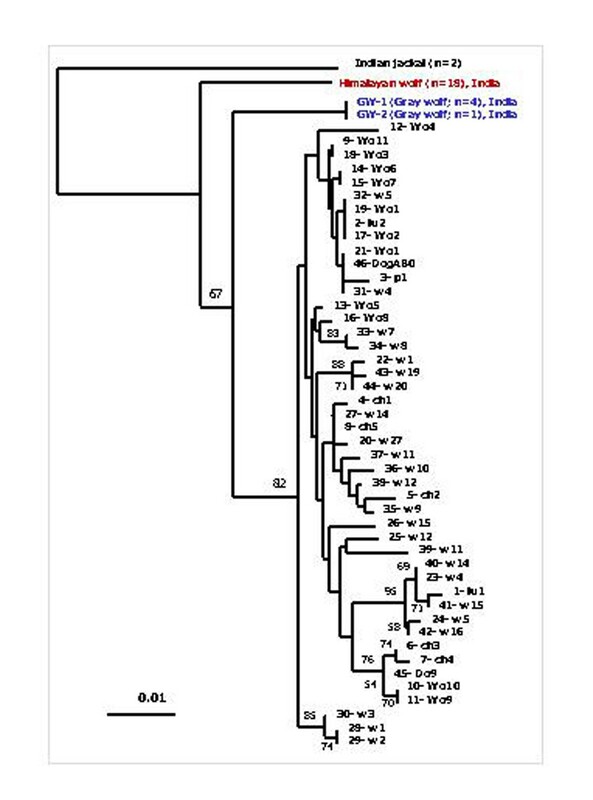 In light of the above results and our present day understanding of canid systematics [8, 18], we hypothesize that the wolves of India represent a pre-wolf, post-jackal, ancestral canid radiation that got separated/arrived in India sometime in early Pleistocene about 1-2 million years ago and since than evolved independently without much interaction with the evolving wolf lineages in other parts of the world. This in turn would suggest that Indian subcontinent had been one major center of wolf/canid evolution, an inference that is in agreement with the school of taxonomists that ascribe an Asian origin to the wolf like canids [; http://www.naturalworlds.org/wolf/history/evolution.htm]. Furthermore, the results of the present study raise interesting questions about the origin and domestication of dogs in India viz., a) whether there are unique breeds that might have been domesticated from the HW and GW independently; or b) dog breeds in India are from Middle-East, Central Asia and Eurasia brought in by invading Mughals, Mongols, Europeans and other visitors over many centuries. The available data from extensive studies on dog origin and domestication [18, 39] would support the second alternative, as few Indian dog samples analyzed therein align with wolf haplotypes (from the above geographical regions) which are essentially very different from the HW and GW analyzed in the present study. Nevertheless, answers to these questions are beyond the scope of the presented data, and calls for further detailed studies to address the origin and evolution of dog breeds in India. Molecular genetic information can be of considerable value in appraisal of phylogenetic discontinuities within and among species. Taxonomies based on morphological traits alone sometime provide inadequate or misleading guides to phylogenetic distinctions but still remain central to our perceptions of biotic diversity including recognition of endangered forms/species. Many molecular genetic studies in recent years have demonstrated such prior systematic errors wherein distinct defined taxonomic groups show little evolutionary differentiation and vice versa , raising serious concerns about the veracity and efficacy of conservation efforts for endangered species. Such cases highlight the need for inputs from high-resolution molecular genetics approaches that can provide firmer foundation for updating the taxonomy and hence help management of biotic diversity in more realistic way . The above concerns are vastly vindicated by the present study that conclusively discounts the currently believed taxonomic status of Indian wolves based on conventional systematics. Neither HW nor GW shares any haplotypic similarity with the purported sub-species of C. lupus i.e., chanco and pallipes, which the two are believed to represent. On the contrary, the genetic diversity analyzed in the present study demonstrates these to be genetically unique to the level of almost new species/sub-species in evolution. These novel findings greatly enhance the biological significance of these already endangered Indian wolf populations and calls for urgent reorientation and prioritization of conservation efforts for their protection and management. Simultaneously, the study reinforces the need for more exhaustive efforts to update and redefine the already complex and debated wolf taxonomy. Finally, our results demonstrate that HW and GW from India are probably the most enigmatic wolves of the world and there is a necessity to revise their existing nomenclature, rechristening them to new species/sub-species status i.e., may be C. himalayeansis (or C. lupus himalayeansis) and C. indica (C. lupus indica), respectively. Infact, such a proposal for HW was made earlier by the first author at the 'International Conference on Canid Biology and Conservation' held at the Oxford University, UK, in 2001, alongwith the proposal to include it in the Red list of Canids'. To our understanding, these proposals were identified for recommendation to SSC/IUCN and wolf specialist group for further consideration. However, it was felt that the study should be extended with more samples to validate and strengthen the case for a separate species status, which we strongly believe is fulfilled in this present work. We thank the Central Zoo Authority of India, New Delhi, Chief Conservator of Forests, West Bengal, Andhra Pradesh and Gujarat, Ministry of Environment and Forests, Government of India for necessary support and permissions, and Mr. M. Banerjee, Curator Nehru Zoological Park, Hyderabad, Dr. B. R. Sharma, curator Padmaja Naidu Himalayan Zoological Park, Darjeeling, Curator, Sakkarbagh Zoo, Junagarh, and their teams of veterinary doctors and animal keepers, for helping with the collection of samples; Mehar Sultana for primer synthesis, Raman Agrawal, TP Velavan and Udaykumar for helping with sequencing, Dr. R. Rajkumar for helping with data analysis and Dr. Yogendra Sharma for checking many drafts of the manuscript and helpful suggestions. The study was carried out under the CZA, DBT and CSIR supported mega project LACONES on conservation of endangered animals of India.